"The film shows a visit to a Québec farm in April. Ice is leaving the stream and it is time for spring cleaning, ploughing and planting." "In 1947, against the filmmaker's [Jane Marsh's] wishes, the NFB prepared a three-part version of the film [Alexis Tremblay: Habitant] titled Spring on a Quebec Farm, Summer on a Quebec Farm and Winter on a Quebec Farm." National Film Board of Canada. 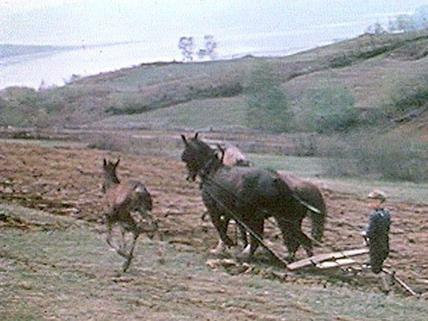 "NFB -- Spring on a Quebec Farm." National Film Board of Canada. http://www3.nfb.ca/collection/films/fiche/?id=11608.